ABB: Publishing great science for over 75 years! 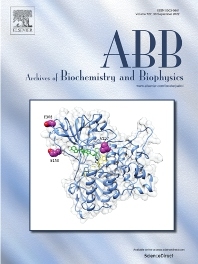 Archives of Biochemistry and Biophysics publishes quality original articles and reviews in the developing areas of biochemistry and biophysics. • Signal transduction, receptors, membrane transport, intracellular signals. Cellular and integrated metabolism. We also provide many author benefits, such as, a liberal copyright and posting policy, special discounts on Elsevier publications, and much more Please click here for more information on our author services.